Before I started running semi-seriously (or whatever the heck I'm doing now) I never tracked how long I had a pair of shoes, or how many miles I ran in them. They didn't wear out; I wore them until they fell apart. When they were too far gone to ignore I'd buy a new pair. I never kept track, it didn't matter. But now, I buy shoes after doing actual research. I go to running stores, sample a bunch of shoes, have my gait analyzed, and don't always buy whatever is on sale. The price isn't a problem since I feel like I'm getting good use out of them. I use runningAhead to track every run, every mile, every minute I spend on my feet. It's great for training, for looking back at the past year or month and feeling a sense of accomplishment, for knowing when it's time to retire a pair of shoes. 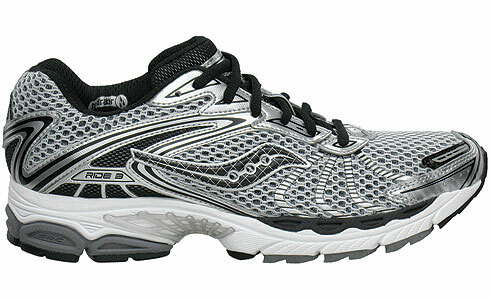 I've just retired my last pair of Saucony Ride 3's after a fine snowy run in shorts. They have 350 miles on them, which I find is just about where I start getting some discomfort after runs, so it's time. Looking back through the log, I just discovered that these were the shoes I used for the Boston Marathon! I was sure it was a different pair, but the computer doesn't lie. They also ran the Bay State Half marathon and the Jingle Bell 5K. All the rest of their mileage was training runs, from 2 to 21 miles in length. I've retired a few pairs of shoes, but these have done the most with me. A quick review of the runs with this pair of shoes brought back all sorts of memories, both good and bad. Of course there was the marathon, but also the 21 mile training run 3 weeks before which let me know that I could do it. There was the very painful 13 miler in September that convinced me to switch from the full to half marathon in October. There was the Jingle Bell Run with Brenda, wearing matching reindeer antlers. All from a single pair of shoes. Like Gu and Clif Bars, shoes are consumables. You buy them in order to use them up. They have an expected life span and they serve you well, but their destiny is to become trash. Perhaps they can be used as casual shoes, or in my case then end up in the pottery studio covered in mud, but their days are numbered. Or in the case of running shoes, their miles are limited. But I'm a nostalgic fellow, and it's rare that something from such an important event in my life gets discarded so easily. I'm not sure what I'll end up doing with this pair, but it's the last pair of Ride 3's I'll ever own. They've switched to the new Ride 4's (which I just ordered). The Ride 3 was the first shoe I had fitted to my feet, and I went through 3 pairs of them. I may just hold on to this last pair.